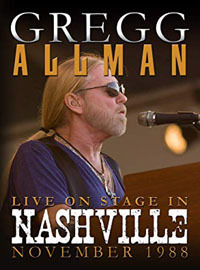 Share the post "DVD review: GREGG ALLMAN – Live On Stage In Nashville"
This new live Gregg Allman DVD was originally filmed live at The Cannery in Nashville in November 1988 and finds the Southern rock legend resurgent following his recent hit with “I’m No Angel”. The DVD contains the whole show but, bearing in mind this footage is now 30 years old, I would have liked to have seen the sound and picture remastered. I would also have liked to have seen some bonus material in the form of interviews from around that time, but unfortunately, that Is not to be. The gig itself is made up of ten songs including recently released material such as “I’m No Angel”, “It’s Not My Cross To Bear” and “Fear of Falling “as well as other highlights like “Just Before The Bullets Fly” and “Slip Away”. Allman’s assembled band gel well together and is made up of guitarist Dan Toler and his brother David on drums, bass player Bruce Waibel and Tim Heding on keyboards, with Chaz Trippy on percussion. The interplay between the band members is at its best in the jam like moments on opening number “Don’t Want You No More” and later on in “One Way Out”. This entry was posted in All Posts, DVD REVIEWS and tagged Allman Brothers, blues, classic rock, DVD, Gregg Allman, Live on Stage In Nashville, review, rock, southern rock. Bookmark the permalink.